Brigid came for 7 days with her husband, Alan McGowan. This was the first time that we had welcomed a couple here for a residency and it worked effortlessly. 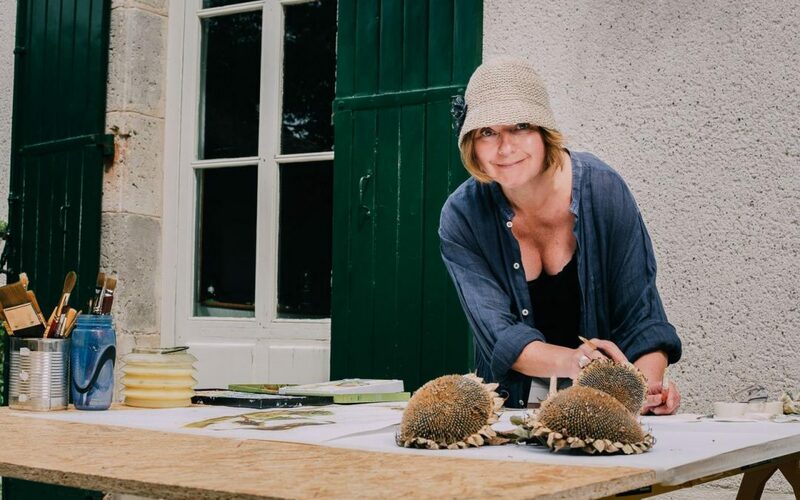 They are both such easy going people, dedicated to their creative work and happy to simply enjoy the town of Nérac, the riverside walk and the gardens here at Studio Faire. In order to make the most of her short residency, Brigid immediately started collecting natural objects that she found in and around the property. She also bought some fruit and vegetables to study from the local farmer’s market. 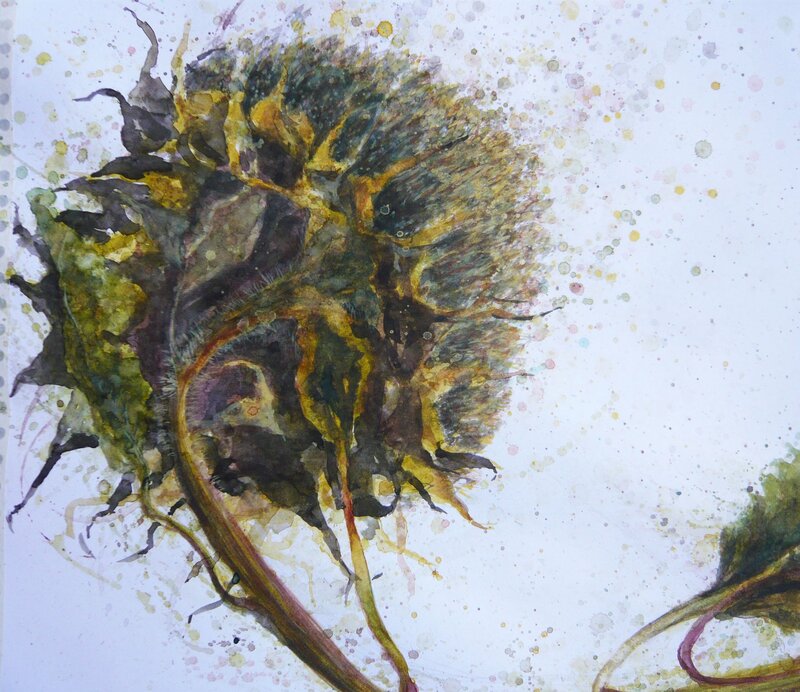 Now, with her collection of fallen conkers and campsis tagliabuana ( or ‘Madame Galen’ with the orange trumpet shaped flower), dried out sunflowers and artichokes, she was ready to paint! For the rest of the week, she could be found in various locations around the garden, chasing spots of sunshine, creating beautiful watercolour paintings and mixed media studies. My time at Studio Faire this summer was quite special on many fronts. Not only was I in need of time away from my usual ‘routine’ (if I can even call it that), but I wanted to refresh myself creatively and this was just the place in which to do so! The warmth of the welcome extended by Julia, Colin, Becca and Dougie (their adorable labradors) surely made settling in a straightforward affair, as everything felt so very natural and easy. A room with two huge shuttered windows onto their wonderful garden truly set the scene for what transpired to be a week of sourcing and painting natural forms, found in the garden, on walks by the river and at the market, abundant with every imaginable colour and texture. I would return to this oasis like a shot and would love to do so regularly, for a dose of everything that this gorgeous part of France has to offer and to the relaxing surroundings that have been carefully created by Julia and Colin, so conducive to art-making and meaningful pause. We would welcome her back anytime to Studio Faire! Our self-directed residencies give people the time, space and support to focus on their own projects, without distractions or expectations from others. 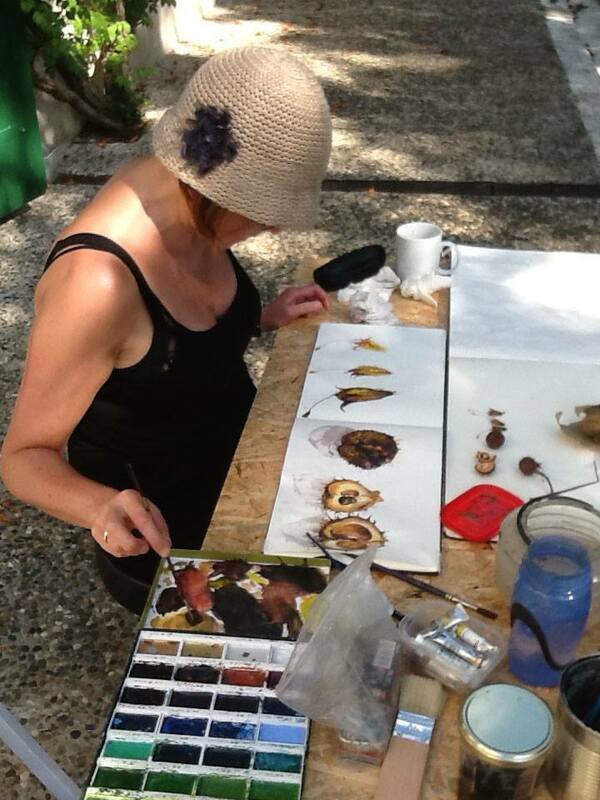 Image: Brigid Collins in the garden at at Studio Faire, by Colin Usher.